William Bradford, a popular American artist, was a traveler and adventurer fascinated with the Arctic landscape. His magnificent volume, "The Arctic Regions," the result of six expeditions to the area, is considered a landmark in the history of the photographically illustrated book. Sumptuously bound and profusely illustrated with original photographs, the text combined sober scientific observation with romantic hyperbole. It features 141 spectacular albumen photographs, including a 2-part panorama, which set it apart from other accounts that were illustrated with engravings. The Art Journal of London hailed the publication as "the most instructive work on the frozen seas that has ever appeared." Working under Bradford''s supervision were John Dunmore and George Crichterson, photographers associated with the prominent firm, James Wallace Black Studio, in Boston. Although these men are credited with the photographs it is now believed that Bradford himself may have taken many of the pictures, which feature remarkable scenes of icebergs and ice floes in addition to pictures of indigenous people ("Eskimaux") and moored ships. 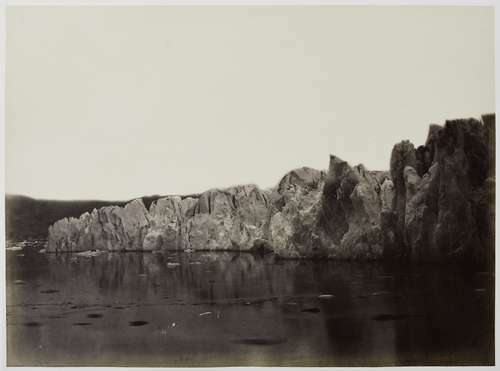 A source of great interest throughout the nineteenth century, the Arctic blossomed in the public imagination, manifesting itself through a widespread desire for images, stories, and interpretations of the seemingly desolate area. The images in "The Arctic Region" depict views of an alien, frozen land and its exotic inhabitants. Recounting his voyage, Bradford described working under adverse conditions. The harsh weather often caused major setbacks and annoyances among the ship''s crew. Dunmore also described a dangerous instance in which both their equipment and lives were at stake: "We sailed about sixty miles to the mouth of a glacier, where the icebergs break off, to take some views. Just as we were landing a large berg broke off which sent the water up twenty feet all over us, and washed away collodion, developing glass, green baize, etc., and came very near taking is along with them." Yet, despite these challenges, they produced remarkable photographs of a stunning, and now endangered, landscape. The volume is a tribute to Bradford''s heroic vision and the photographers who skillfully worked in the most difficult of circumstances.